A basket of these cute crocheted mini Easter eggs make for a perfect decoration this coming Easter. Make dozens of these colorful mini crocheted eggs to display or to give away! Play with colors and add your own style, there’s no limit to what you can do! In fact, these mini crocheted Easter eggs are so easy to make confident beginners will definitely enjoy making them. Need help with magic rings? Find a great tutorial here: Crocheted Magic Ring [A How To Tutorial]. 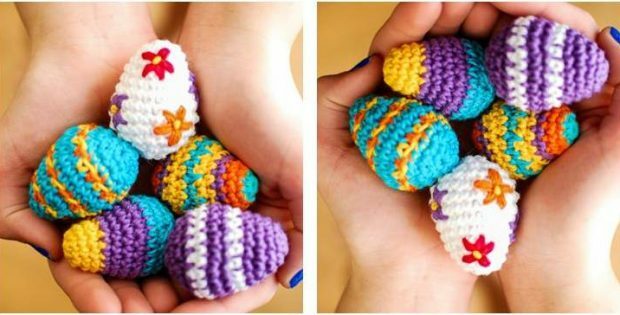 The pattern for this crocheted mini Easter eggs includes instructions on how to make tiny versions of a standard egg. But you sure can make them any size you want! The pattern for this lovely crocheted mini Easter eggs is a design by Petals to Picots. In fact, you can access the FREE pattern for these adorable crocheted mini Easter eggs.